Judy Odom was born May 9, 1940 in Cleveland, Missouri and departed this life on September 10, 2018 at Research Medical Center in Kansas City, Missouri at the age of 78 years, 4 months and 1 day. She was the daughter of Wendell C. and Hazel L. (Van Eaton) Cravens. Judy was a lifelong resident of Cleveland and graduated from Cleveland High School in 1958. On October 10, 1958 she was united in marriage with Benny C. Odom at the Cleveland First Baptist Church and to this union four daughters were born. Judy was proud to be a “housewife” and a devoted, loving, caring, and wonderful wife, mother, grandmother and great grandmother, and the best boss Benny ever had. She attended every activity her children, grandchildren and great grandchildren participated in. She was also a mother and grandmother for a host of other children who loved and looked up to her as a wonderful role model. 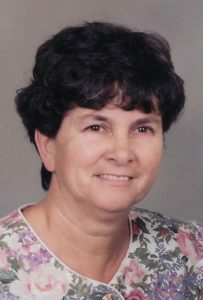 Judy was an active member of the Cleveland First Baptist Church, where among many things, she was a dedicated Bible School teacher and director. Judy liked gardening and working with her flowers. She had her own mower, (which nobody else could touch) and spent countless hours mowing her lawn until it was exactly like she wanted it. In the winter, when she couldn’t be in the yard working, she would put puzzles together. Judy had been a member of the P.T.A. as well as the Royal Neighbors of America and a community leader for the Cass County 4-H. But with all her activities she was never happier than when she was organizing family dinners and game nights, here she was truly in her element, surrounded by the ones she loved. Judy was preceded in death by her parents, Wendell and Hazel Cravens; one great grandchild, and her grand dog and constant companion, Slack. Judy is survived by her husband, Benny Odom of the home; four daughters, Tammy Lueker and husband Dennis, Julie Holder and husband Aaron, Amy Hinkle and husband Mike, and Betsy Frazier and husband Ron, all of Cleveland, Missouri; twelve Grandchildren, seven Great Grandchildren, other relatives and many, many friends. The family of Judy Odom will receive friends from 5-8:00 p.m. Friday, September 14, 2018 at the First Baptist Church of Cleveland, MO. Funeral Service will be held at 11:00 a.m. Saturday at the First Baptist Church of Cleveland, MO. with Brother Henry Green officiating. Casket Bearers will be Dennis Lueker, Aaron Holder, Mike Hinkle, Ron Frazier and Aaron Hoskins. Honorary Bearers will be her Granddaughters and Grandsons. Interment will be in the Glenwild Cemetery. Betsy and Family, So Sorry For Your Loss. Prayers for Strength and Peace in the days to Come. She raised an Amazing Family. To my beautiful cousin Judy. I’ll always remember your beautiful smile and your sense of humor. You were taken to soon. My God welcome you and provide those you leave behind. I love you. Judy took the Hastie family under her wing over 20 years ago – She loved fiercely. We are all sorry for your loss and the loss of “One of the good ones”. Love and prayers for you all. I am so very sorry to hear of Judy’s passing. Sending prayers for comfort and peace to Ben and the family. Our families (Todd’s) were friends for many years. I know Ben and Judy have been stalwart members of the First Baptist Church in Cleveland even since we Todd kids were very young and our mother Phyllis played the piano. Thinking of you all during this sad time. God bless you all. Judy was an amazing lady!! She was not just our friend but Family!!! My heart hurts for everyone but mine hurts to gonna miss your sweet face!! Benny and family, we are so sorry to read of Judy’s passing. We know she is in the loving hands of Jesus, but you will all miss her. Praying for comfort and peace for your family.